The pelvic support osteotomy (PSO) is a hip bypass procedure where the upper femur is bent at an angle that stabilizes the connection between the femur and pelvis to allow walking with less limp. The pelvic support osteotomy is a very old procedure that was revamped by Ilizarov, whose principles are followed with the type of PSO used by Dr. Paley since 1988. These patients initially undergo only the soft tissue releases of the SUPERhip surgery. Serial lengthening with external fixation to the pelvis, femur, and tibia are performed to equalize limb length discrepancy. The PSO is finally performed just prior to or after skeletal maturity. Once skeletal maturity is reached, the pelvic support osteotomy is performed. The reason the PSO is not performed earlier is that natural growth and remodeling of childhood will undo the PSO if performed too early. The PSO includes two osteotomies. First is the proximal osteotomy. 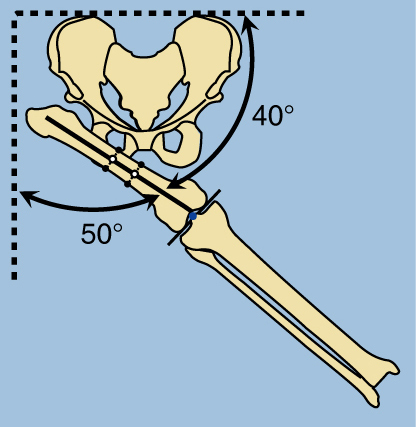 The femur is oriented into maximum adduction and is oriented at a 50-degree-40-degree relationship to the pelvis. This will determine the level of the proximal femoral osteotomy. The proximal osteotomy is then performed. 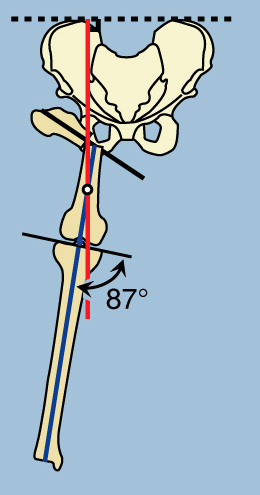 The femur and tibia is at an 87 degree angle to the knee joint (represented by the blue line). This line should be perpendicular to the pelvis (represented by the red line). In order to correct this alignment, the blue line and the red line will need to overlap. A second osteotomy, the distal osteotomy, is performed where the two lines meet. The distal osteotomy is then performed and the femur lengthened with an external fixator. The fixator realigns the femur and tibia by reorienting the regenerate bone. This orients the femur perpendicular to the pelvis (blue and red lines are now the same), restoring normal alignment. 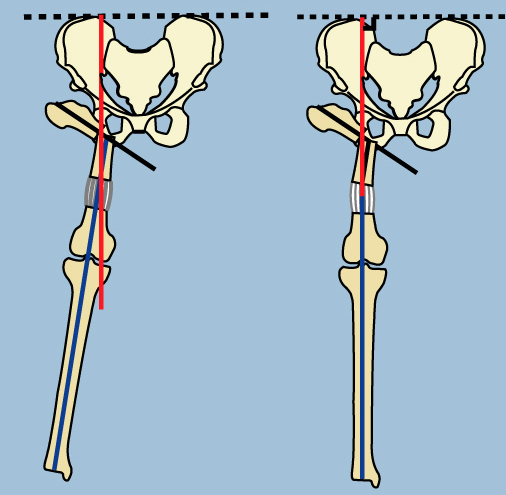 Distal osteotomy and lengthening of the femur restores normal alignment: the red line and blue line are now the same. The femur and pelvis are now oriented in the correct angle. This stabilizes the joint and will allow the patient to walk without a limp.